I collapsed in my bed and began sobbing. How could this be happening? Why weren’t all my parenting “tricks” working with this child? No, most people would just say my daughter was “free-spirited”, but I knew she was no where close to what I was raising her to be. I had read every single parenting book that was available. I had prepared for this stage in my life. I had successfully raised another three-year-old who was well-behaved, polite and obedient. But this three-year-old? This toddler? She defined the word impossible. It’s such a dreary, crushing word when you apply it to raising one of your children. But I was beginning to think that “impossible” would be the true summation of my entire parenting experience with this bubbly, brilliant, but defiant child. Did I mention that she was only three-years-old. Ok, just checking. Yes, this is the second time I’ve mentioned her age, but I don’t want you to miss it because it’s uber humiliating to be defeated by a three-year-old. What was this three-year-old like that defined the word impossible? She was the one that looked every which or way to see if anyone was watching and then would purposely go do exactly what her parent had told her not to do. It was like a “happy rush” for her to be sneaky! She liked that word. She liked to couple that word with sticking out her tongue. And yes, she was the ONLY child (out of our six kids) who was brazen enough to slap her Grandmother across the face. She would also be the one to stand up and walk across a pew during church when you motioned for her to come sit beside you. And when she was at the end of the pew? She stepped on a Bible and slipped and fell — during the church service. On the very front row. She was also the one who would refuse to follow simple instructions like “raise your arms” when you wanted to get her out of the high chair. I mean a long, daring stare and then an obstinate folding of the arms. She let her body language speak loud and clear. And yes, she was the one who would fall asleep at the table because she would absolutely refuse to eat her veggies. And, she would be the one that would somehow super sleuth her way into the kitchen, grab cookies and hide them in her sleeves. And yes, this mom did a “cookie pat down” very often. 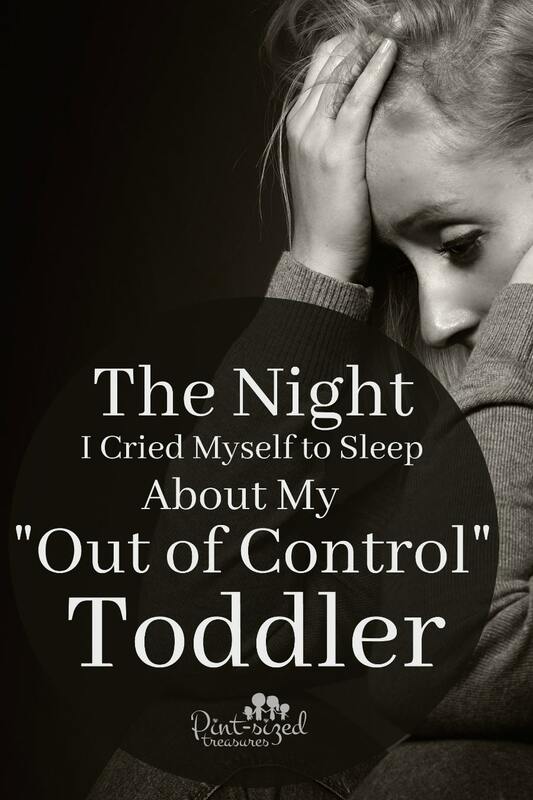 One night all her three-year-old misdemeanors seemed to topple on top of me and plunge me into the depths of parenting despair. How in the madness could I not get a three-year…a THREE YEAR…ahem…a three–year-old to listen, obey and just act like a normal human being? In the midst of my tears and weighty sobs, I called out to the One I should have cried out to in the very beginning. Those desperate pleas were the last thing I remembered before I woke up to a little hand patting my arm. “Mommy? Mommy?” came the very tender voice. I groggily opened my eyes that were red, puffy and painful from a night filled uncontrollable sobbing. “Yes?” I asked in emotionally exhausted confusion. “Mommy, I want to help you today. What can I do?” her tiny voice seemed quite angelic. I was floored. I almost pinched myself to make sure this was really happening. Is that really my little auburn-haired three-year-old offering her help? Then I immediately remembered my prayer to my loving, caring Heavenly Father. My heart melted in thanks to God and burst with exuberant joy to see my daughter begin her journey in becoming a kind, caring, obedient daughter. God taught me a lesson through that little girl. He taught me that no matter how many parenting books I’ve read or parenting “hacks” I’ve tried, HE is still the one in complete control. He can move the heart of kings, right? I’m more than sure he can move the heart of a three-year-old! He also taught me to pray for the hearts of my children. Fervently. Continuously. And also taught me some creative consequences that have been very effective in our parenting journey. Sometimes you HAVE to get creative in that area, right?! And, through some older, wiser moms, he taught me that my main focus in parenting should be winning my child’s heart. That’s not as easy as it sounds, it’s the truly, powerful, secret sauce of parenting. She’s a brilliant, kind, obedient teen who’s crazy helpful and is a shining example of what God can do if parents will just let Him and His truths guide their parenting journey. So I ask you, dear mom, do you have a child who has made you heap gigantic tears onto your pillow at night? Is there a child who gives you red and puffy eyes? Just look up, dear mom. Ask the One who created you and your child for guidance and help. It will come. And when it does, your heart will be thankful and joyful towards a God who sees, hears and knows all about your parenting needs. He loves your “out of control child” way more than you — and light years more than any other being in heaven or in earth. May you find your answer today. Want more help for your “out of control” kid? 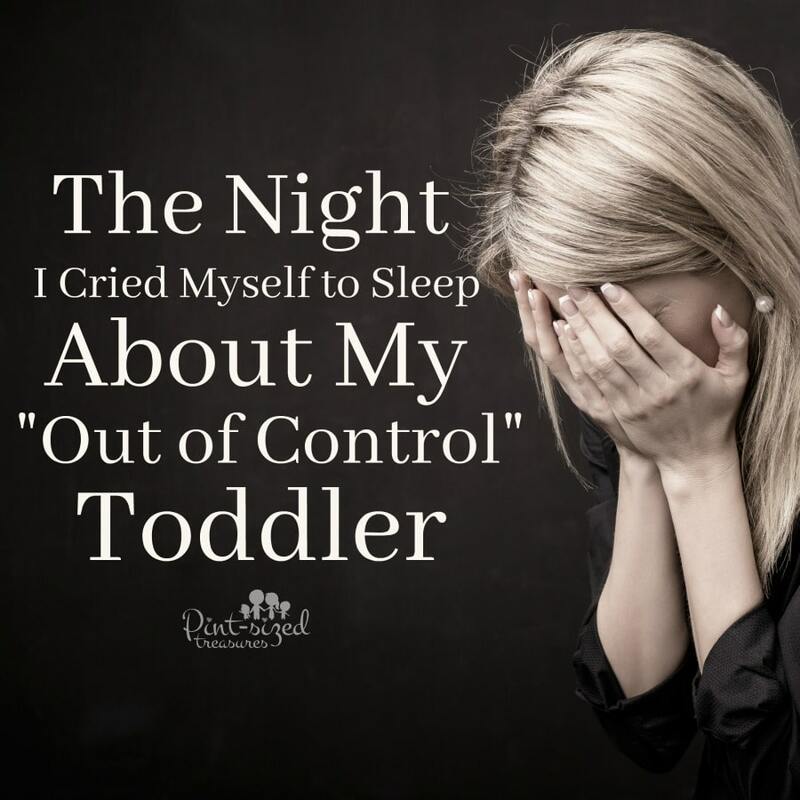 Check out this post that’s full of the best parenting tips for an “out of control kid”.